For almost two decades SINOI has been standing for first-class quality in connection with continuous innovation. Since 1998 wind turbine rotor blades in the multi-megawatt class and sophisticated composite components have been produced at the production site in Nordhausen. 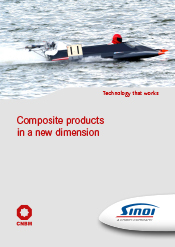 These extensive experiences we have made with composites - both glass fibre and carbon fibre - in the serial production represent an important basis for our customers.